In writing my series on Casco Bay Island libraries, it occurred to me that some of the islands, such as the Diamonds, need a “Little Free Library” to make books more accessible in their communities. What is a Little Free Library, you may ask? According to good old Wikipedia, Little Free Libraries are a community movement in the United States and worldwide that offers free books housed in small containers to members of the local community. They are also referred to as community book exchanges, book trading posts, and pop-up libraries. In Whitefish Bay, Wisconsin, the village is requiring a church to take down their Little Free Library, worrying about inappropriate material being placed and saying that there was no point in a Little Free Library due to the public library. Whitefish Bay is, in addition, denying permission to any family that asks to have a Little Free Library placed in their front yard. Libraries have been donated to rural areas that have no libraries of their own, or that have been ravaged by disasters. As of February 2013, all 50 states and 40 countries worldwide have been involved in the literary program. 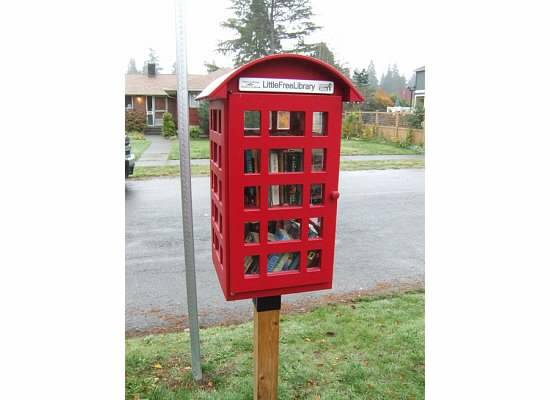 There are currently 5000 registered Little Free Libraries in the world, with an estimated 1000 unregistered. Each Library is uniquely built incorporating materials from the community it is located in. According to the official website, the closest ones to Long Island are in Falmouth, South Portland, and Cape Elizabeth. Of course, on Long Island we are blessed to have our beautiful library, open every day of the week, but for many communities, that are either too small or seasonal to sustain a library, or those that are unable to afford a library due to economics, this is a fun and easy way to share literature with your neighbors.